The Aeolian-Skinner organ, Opus 1134, is one of Symphony Hall's most prominent features. Built in 1947 to replace the original Hutchings organ of 1900, the instrument was designed by G. Donald Harrison, President and Tonal Director of Aeolian-Skinner of Boston, the preeminent American organ builder during the first half of the twentieth century. When first installed, it was widely recognized as one of the most versatile concert hall organs in the world. Inaugural concerts with the BSO took place in October 1949 with renowned organist E. Power Biggs at the keyboard, and organ recitals were for many years a regular feature of Symphony Hall programming. The organ is frequently called "The King of Instruments, the Instrument of Kings." Without a doubt, Symphony Hall's Aeolian-Skinner is the largest and most complex instrument owned by the BSO. Built in the historic American Classic style developed by Harrison, the instrument incorporates the façade, the pipe-work, and some mechanical components from the Hall's first organ, housed in a chamber behind the stage shell that is 12 feet deep and 40 feet high (a space equivalent to that of a sic-room house). 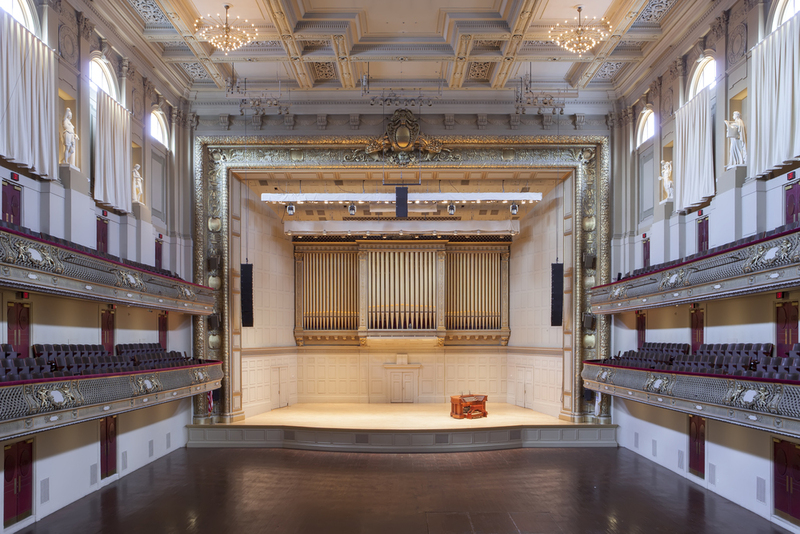 The famed acoustics of Symphony Hall favor the organ, and the installation is regarded by the organ builders and acousticians as one of the very best marriages between an organ and the space in which it functions. Completed this past summer, the renovation of the Symphony Hall organ began in January 2003, when the entire organ-including some 5,000 pipes-was removed from the organ chamber, which had itself been completely refurbished. The renovated organ-now incorporating some new pipes and divisions, as well as a new console design-was reinstalled during the summer of 2003; tonal finishing and tuning was completed in the summer of 2004. Of equal importance to the renovation of the organ was the establishment of a permanently endowed fund for its care, enabling the BSO to remedy mechanical problems common to the aging process as they occur, and to undertake necessary cleaning and other maintenance on a regular basis.